It's always amazing to taste the older bottlings of Mondavi Reserve Cabernet Sauvignon. I think the last one I tasted was a 1974 Mondavi Reserve with a bunch of friends. I didn't leave specific tasting notes for that bottle, but I remember it holding it's own against the 1974 Chateau Margaux that we tasted the same night, which if you read the review I gave it 98 points. 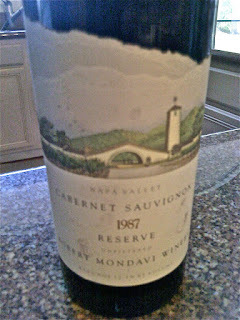 I'm not entirely sure how well the Mondavi wines are being made these days, but when the old man was still around and actively involved in the process, the wines were world class. The bouquet of this wine was far superior to any of the wines we were tasting this night. In fact, in my notes I said it was a 100pt nose! Here's some of the descriptors I wrote: Spearmint, herb, bark, wet stone, and cherry. An amazing nose that evolves every 30 seconds in the glass.